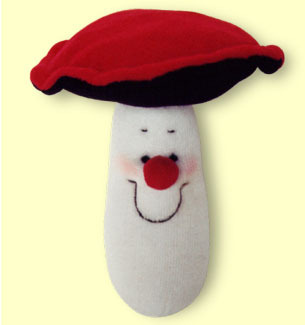 Whimsical Mushroom helps babies develop their senses of sight, sound and touch with it's high-contrasting colors, fun noisemakers and soft texture. It makes a lovely, cuddly companion for a toddler and can help discover basic colors and words. It is made of soft, bright-colored velour and has a cute face with baby safe stitched eyes. It rattles when shaken, and its hat crinkles when squeezed. © 2007 Veta Brandel (Toys by Veta).